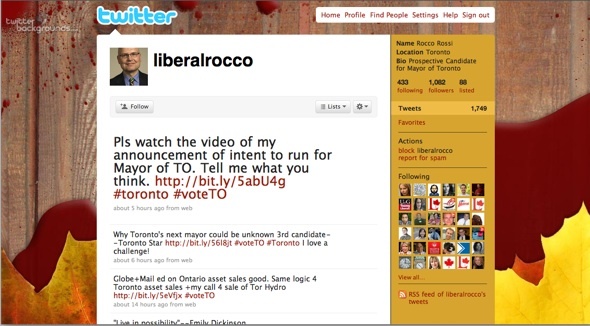 The Toronto mayoral candidates are starting to surface, but how web savvy are they? I was sad to hear the news of Toronto Mayor David Miller's exit from office next year. As a member of Toronto's tech community I was always happy to see his willingness to embrace tools like Twitter, his presence at technology events like Mesh and TEDxToronto, and his projects like Toronto Open Data. But as the saying goes, out with the old and in with the new. With Mayor Miller on his way out the city has been abuzz with potential Mayoral candidates - the air is rife with speculation, and people are already taking bets on who will win the race. So how will these new candidates follow in Miller's tech-friendly footsteps? Before the race officially starts on Jan. 4th I'd thought I'd outline five potential candidates' tech prowess. Read their Twitter stream, take a look at their websites...and maybe you'll find a candidate that resonates with you. Twitter: @Smitherman2010. No updates on Twitter yet other than one advising to stay tuned in the Spring of 2010. Is a Twitter account for the purpose of sending election updates better than no Twitter account at all? You'll have to ask Obama. Facebook: No official fan page, but there is an "Elect George Smitherman Mayor of Toronto" group with over 1,000 members. 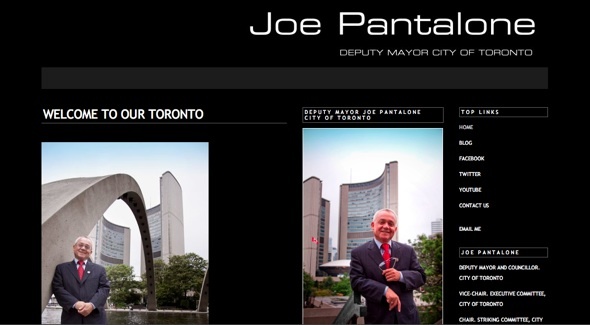 Website: He owns JohnTory.ca, but hasn't done anything with it yet. Twitter: Personal account: @John_Tory - First update on November 6th, and a steady stream since then - mostly related to his talk show on Newstalk 1010. Website: RoccoRossi.com - another page under construction. Twitter: @liberalrocco Rocco has over 1,000 Tweets and followers, and throws around hashtags and Bit.ly links like a pro. Facebook: His personal Facebook page is private so you have to be friends with him to see any of the information. Website: Doesn't seem to have a personal website - only his page on the Toronto.ca site. 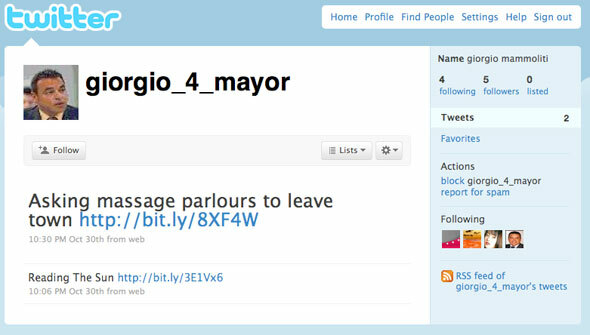 Twitter: The @giorgio_4_mayor is the only Twitter page I could find - with only two updates. Facebook: He also has a private Facebook page. 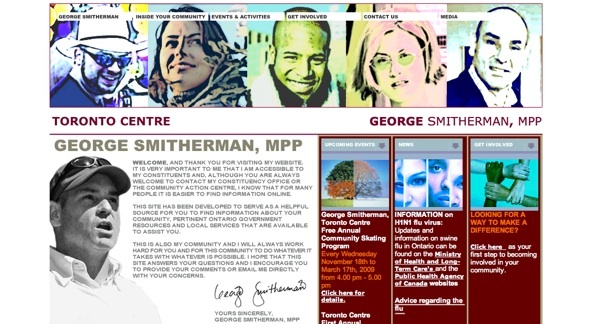 George Smitherman has the best website, and Rocco Rossi has the most comprehensive Twitter stream and Facebook fan page. 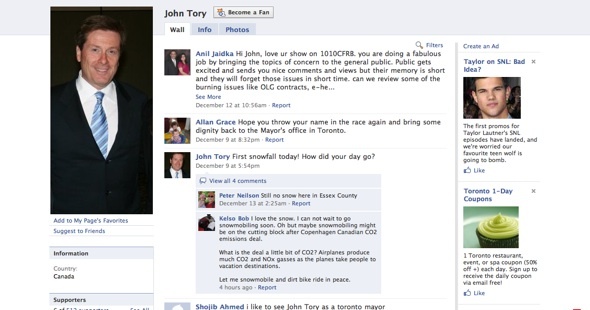 John Tory has a ways to go in terms of building up his following online, and leveraging each tool. And I'd love to see a blog of the campaign trail from each of the candidates. While these things don't reflect what they stand for, they show how willing they are to embrace new online tools - something Mayor Miller does extremely well. Do you care how wired your candidates are? Would it make or break your decision to vote for them?